Why do we pray the Rosary? Where does it come from? Why do we say so many Hail Mary's? Does it matter what kind of beads we pray on? These are some of the questions I often hear about this beautiful prayer of our Catholic tradition. The Rosary, as we know it today is composed of three sets of five Mysteries, each represented by one Our Father, 10 Hail Mary's, the Glory Be, which is often followed by the Fatima prayer. The set of beads that we pray on consists of 59 beads with a Crucifix and a medal, arranged in the standardized order of five beads between the Crucifix and medal, followed by a loop containing five sets of 10 beads, separated by four beads, which may be the same or different. Tradition holds that the Rosary in its present form was given to St. Dominic by the Blessed Mother. Originally, the Rosary was the people's attempt to emulate the prayer of monastic monks, who prayed the 150 Psalms daily. At that time, most people were illiterate and could not read the Psalms to pray them, so they substituted 150 prayers that were easily memorized, usually the Our Father and the Hail Mary. The method of reciting and the beads counted on were not standardized. Eventually, the Mysteries were added, to focus the prayer. The Mysteries, as they are called, recount the story of the Gospel - of the miraculous birth, childhood, suffering, death, and resurrection of Our Lord and the promise of eternal life to those who follow Him. The sets of beads were standardized to conform to one Our Father followed by 10 Hail Mary's. Later, the Apostles Creed and the Glory Be were added, and finally there was a standardized method of reciting the Rosary, as well as a standardized set of beads, consisting of 15 sets of 10 smaller beads with one larger bead at the beginning of each set. These were worn around the waist of monks and nuns like a cincture, They were, however, too cumbersome for the average person, and so shorter versions of the set of beads evolved. In the 17th and 18th centuries, women wore rosaries as a necklace, much as monks and nuns wore theirs as a cincture. In many countries, the custom of wearing a rosary as a necklace still exists. Perhaps it was abandoned in the United States because Catholics were persecuted by puritanical sects. The rosaries of the 17th and 18th century were elaborate pieces of religious jewelry, made of gemstones, with filigree Our Father beads containing sachet, to scent the prayers much as incense is used in Church. Men carried strings of ten beads with a crucifix at one end and a reliquary at the other. But, why pray the Rosary? Why say so many Hail Mary's? Doesn't that give more importance to Mary than to God? The Rosary is a Gospel prayer, to the glory of God the Father, Son, and Holy Sprit. We focus our prayer on God from the very begining with the Apostles Creed, which contains the basic beliefs of all Christians. We begin each decade, or mystery,with the Our Father, the prayer that Jesus himself taught his disciples to pray. We conclude each decade with the Glory Be, which is to the Holy Trinity. 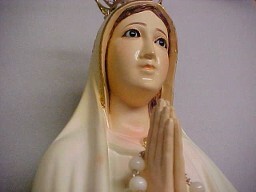 In between, we pray 10 Hail Marys to invite the Blessed Mother of Jesus to pray with us and for us. She is our prayer partner as we contemplate the life of her Son. As we pray, we can look for ways to relate the Gospel to our own lives, or those for whom we pray. For example, in the First Joyful Mystery, the Annunciation, we see Mary's example of a frightened young girl who accepts God's will to bring His Son into the world. We can pray for all expectant mothers to chose life for their unborn child. In the Second Joyful Mystery, Mary puts aside her own confusion and goes to visit her cousin, Elizabeth. The child in Elizabeth's womb jumped for joy as he recognized the presence of Jesus in Mary. We, too, can visit the sick and the imprisoned, and bring Jesus to them in the Holy Eucharist, or pray for those who do so. Each Mystery offers such an opportunity for personal prayer. It is a living prayer, just as the Gospel is meant to be lived. Does it matter what kind of beads we pray on? Actually, no. As a matter of fact, you have in your own 10 fingers a method of counting the prayers without any beads at all. The plastic beads on string that are sent to the missions, blessed by a priest, are just as good to count the prayers as the most elaborate and costly rosary. Why, then, make a rosary in more elaborate designs? I believe that when one holds a rosary in their hands, they should feel like they are holding onto a piece of Heaven. I strive to make rosaries in the old tradition, a work of religious art. I believe that since the Rosary is to the glory of God and a gift to the Blessed Mother, it should be a thing of beauty that will inspire its owner to pray it often. Whatever your choice in beads, pray your Rosary often. Focus on the Gospel Mysteries and how they tie into your life and the lives of those you pray for. This devotion is one of the great gifts of our Catholic faith tradition. The late Holy Father, Pope John Paul II declared the year from October 2002 to October 2003 as the "Year of the Rosary". In his letter to the Bishops, he also proposed a new set of Mysteries to be incorporated into the Rosary prayers. He called them the illuminating or luminous mysteries. These new mysteries serve as a reminder of Jesus ministry and the sacraments that He instituted. They bridge the "gap" between the Joyful and the Sorrowful Mysteries. The Holy Father suggested these mysteries as a way of reflecting on the example that Jesus set for His disciples, which indeed, includes all of us. May they enrich our prayers of the Rosary and bring us ever closer to Jesus and His Blessed Mother, who is our mother as well.